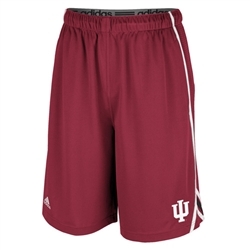 These great new shorts from ADIDAS feature lightweight 100% polyester knit and make for a terrific workout short. Crimson with Climalite textured mesh side inserts and white and black striped details. These are finely embroidered with the IU and the ADIDAS logo. As is true of most basketball shorts, these are nice and long but have the bonus of bilateral side seam deep pockets and a drawstring. Contrast charcoal stretch taping & 3-stripe detail line the waistband. Mens (unisex) sizes and very spacious.